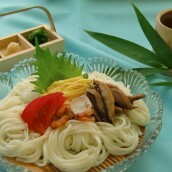 The dish transmitted to Kusu, Hita and Shimoge area. 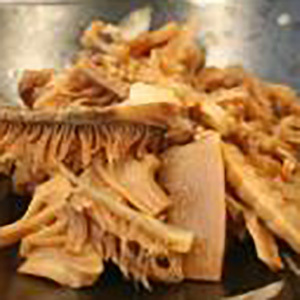 TARAOSA (cod stomach) is dried fish of having within which leads to from Ella to entrails and is necessary to a tray dish. 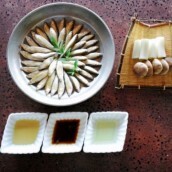 At which house is nishime from TARAOSA also made certainly from the past for the tray dish to which you devote yourself with completion of a framework? There is also an opinion maybe which was taken out as a treat in the Lantern Festival when visitors gather because fish from sea was difficult to get before, and even dried fish was valuables. 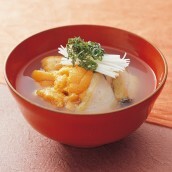 Bamboo shoot puts a night in water and returns it with Taraosa. 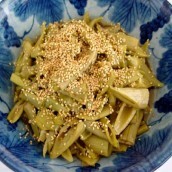 When it's blanched, and it's put on the cooking liquid about one night just as it is, bamboo shoot becomes soft. Returned bamboo shoot cuts about 2 cm of diagonals and Taraosa into bite size. The konnyaku is made about 2 cm of strip of paper limit. 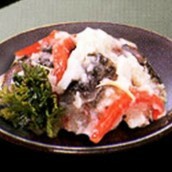 Bamboo shoot and Taraosa put konnyaku in a pot including water, and it's cooked on low heat for about 1 hour. 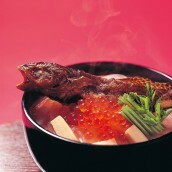 The flavor is given by sugar and soy sauce and more are boiled for about 2 hours.